To one young narrator, it's the simple things that mean the most, like sharing laughter with a friend, taking family rides in the country, and kissing her mama's arm.When this poem was first published in 1978 in Honey, I Love and Other Love Poems, Eloise Greenfield reminded us that love can be found just about anywhere. Now, twenty-five years later, she and celebrated chilTo one young narrator, it's the simple things that mean the most, like sharing laughter with a friend, taking family rides in the country, and kissing her mama's arm.When this poem was first published in 1978 in Honey, I Love and Other Love Poems, Eloise Greenfield reminded us that love can be found just about anywhere. Now, twenty-five years later, she and celebrated children's book artist Jan Spivey Gilchrist present a stunning, newly illustrated anniversary edition that invites readers to celebrate the simple joys of loving and living. Absolutely delightful, beautiful, fun and important. I hope everyone who interacts with children of any race or culture shares it with them. And I hope it brings more of us to the classic Honey, I Love and Other Love Poems. Gilchrist's narrator is a charmer that I believe we can all fall in love with. Can you guess the one thing she does *not* love? Age group:7-11Eloise Greenfield I did not necessarily like this book. The story line was ok. It just talked about all the things that the little girl loved but the structure of the book was not good. There was little to no punctuation that made it one big long sentence. At the end of each thing she liked there was never a proper start to a new thing she liked. Like I said one big long sentence. Honey, I love is one of my all time favorites! I can't wait to read this out loud. I love the original collection of poems by Eloise Greenfield. This picture book version is over a dozen years old now and its age is showing. The hairstyles and clothes are very 90s. However, the idea of turning a poem into a picture book is inspirational to young writers. This is a great book. I really enjoyed reading. Poetry for young readers is great. This story follows a young girl through the things in her life she loves. Things like her cousin, his voice, playing in the water, but not sleep. A simple book with great Illustrations. This was a poem that showed empathy and love toward the world. This could be used as an example for students for how to write an engaging poem. Written in the late 1900s, Honey, I love is a poetry book about a young girl and all the thing she’s loves and man does she love a lot of things. This book is full of bright watercolor pictures that explain all the things this young girl loves and enjoys to do on a daily biases. The bright colors express her bright personality and big smile but there’s just one thing she doesn’t enjoy and that would be going to sleep at night. Such joy in the words and pictures in this book. Impossible to read without smiling. I've always found the poetry of Eloise Greenfield to be uplifting and pairing this poem with Jan Spivey Gilchrist's illustrations makes you want to be there with the narrator as she moves through a summer day. This works very well as a mentor text for young poets, or simply for a splash of fun in the day. Author: Eloise GreenfieldTitle: Honey, I lovePlot: A girl tells of all the things she loves such listening to her cousin, riding in her uncles car, going to the country where the church meet and sitting with her mother. She tells what she doesn't like also. Setting: The girl's home and townCharacter: the girl, cousin, uncle and motherTheme: Love, Family LifeStyle: Poetry; FictionCopyright: 2003Notes: This is a good book to discuss love, family and friends. This story is a great lead-way into a module about things that they like and do not like. The children can work together to create their own classroom story/poem, each saying something that they love. Another way to use this story is to have the students draw pictures to match all the things that the young girl in the story loves, or draw pictures to express what they love. Even if they do not incorporate words and letters, this is still a way for them to develop their language. 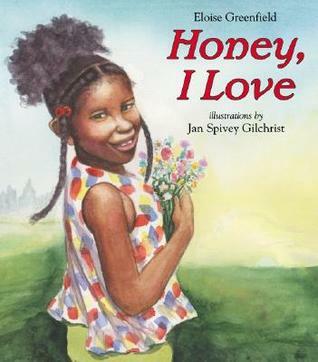 Honey, I love is about an African-American child who joyfully recounts the things that make her life special. The text appears as a stand-alone poem. For a literacy lesson, I would have students to learn about "voices" in a text and what words indicates the age of the little girl and what words does she utilizes that makes this text stand out? I would have students to write about what makes their life special and have them to write in phrases, poems, or sentences. A young girl talks about all the things she loves - and the one thing she hates - her mama telling her it is time to go to sleep. Who doesn't remember how hard it could be to go to sleep on a hot summer night? Since the book is a poem in addition to being a picture book, it would be great to use in a classroom with 1st and 2nd graders. They could talk about the things they love - and one thing they don't love. Honey I love is a great book! The story is really a poem. It is an easy read and uses simply languages that young students will be able to relate to. Students can read this poem or have it read to them and be inspired to write their own type of poem. The book has some repetitiveness in it, which I think is great for younger children. I love how this book also shows culture, the pictures and the dialog in the book are beautiful. The young girl loves lots of things. She loves when her cousin comes to visit, the laughing sound and taking rides with her family. The book is written in poetic form. It would be a great book to teach poetry or multicultural. The pictures are warm and inviting for young children. I would use this book with students from kindergarten to second grade. I would use this a a way to draw stories and memories from students. They could create story books and poems that are similar to the story and allow the rest of the class to join in their trip down memory lane. This could also be used for making connections to the child's family and the roles each family member plays. This book can be considered a book of poetry although it only has one poem. The lyrics rhyme, but it also makes you want to speak like the author. The voice of the book is authentic. The illustrations are bright and very life-like. I think this book coud be suitable for primary or intermediate grades.